Above = Tall ship Tecla. Have you got any contributions? - Use this link. "BEWARE THE TIDES OF MORBIHAN"
But I'm getting ahead of myself. The Semaine du Golfe (not a week of golf, that would be a whole different ball game) has vast numbers of boats, racing (of sorts), picnics, islands, oysters, music spectacular beauty, all culminating in a mad parade of sail on a flood tide, a huge spectator fleet, choppers above, choppy waters below, and did I mention the tall ship Tecla? 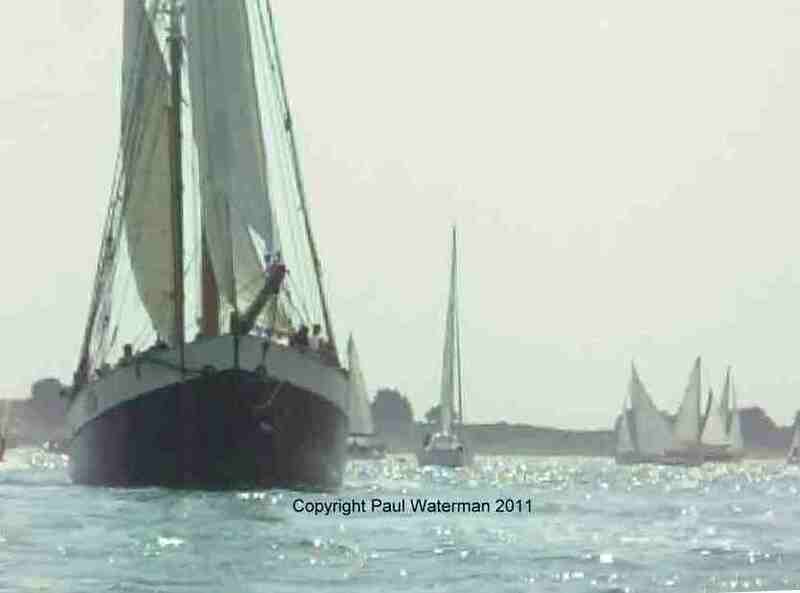 What happens is you race with your class (Molly was in Classic Yachts Under 8 Metres. Yes, she is over 8 metres, but you can't have everything) from one port to another, stopping for lunch (this is France, after all) and at the end of the day are bussed back to base. The next morning you are bussed back to where you left your boat and do it all over again. At each port you eat oysters. It's the race for these molluscs that is most fierce. Ah yes, the racing. If you can find the start line, you can race. If you can find the finishing line, you might even win. But those two things are easier said than done since the French have an interesting attitude to the formalities of boat racing. Once we even found ourselves heading out to sea to a turning mark around a cardinal buoy two miles away with not another boat in the race. Had it been cancelled? Were we miles ahead? Miles behind? We never found out. One race we saw the marker buoy for the finish line being towed away. Were we so slow that we had finished last? We landed and then saw they had not even set the finish line yet. So were we so fast we were first? We never found out. One race we knew we had started and knew we finished. We think we were second. We never found out. And one race we were heading for the finish line when all of a sudden it disappeared to port as the mighty tide just picked us up and deposited us outside the gulf. It was so strong we couldn't row back against it. And so to the last day and the great parade of sail. You muster outside the gulf, your fleet is told that one of the tall ships is your leader, and your class follows it in. Simple. But "beware the tides of Morbihan"...we were proceeding in a northerly direction, tacking back and forth, heading for the final celebrations, when it happened. The flow is so strong it creates whirlpools, and one minute we were fine, the next, no steerage way at all, no control, quite helpless... and what's that coming up behind? Did I mention the tall ship Tecla? There was a lot of shouting, her skipper threw her engines in astern (not sure I heard him make the correct sound signal for this, but we'll forgive him), we were unable to tack so there was a coming together and our forestay hit Tecla's bobstay. Luckily it was comparatively gentle, we pinged off, and one moment we were going down her starboard side, the next her port, safety ribs frantically trying to pull us clear. Then we were free and thankfully no harm done to anybody. On we sailed to the finish, hauled out Molly, and tried not to dwell on what might have been. The crew for this adventure were Geoff, Madeleine, Caroline, Paul, Robin, Steve, John Evans and Stener. On the drive back to Le Havre Paul had the chance to release his inner Lewis Hamilton as traffic delayed us and we zoomed onto the ferry with seconds to spare. But doing 90 on the wrong side of the road was as nothing compared to the marine mayhem. Did I mention the tall ship Tecla?